Man Fung-Yi (b.1968) is a Hong Kong artist who has exhibited in over 100 shows in New York, Paris, London, Sweden, Barcelona, Beijing, Japan, Korea, Taiwan, Hong Kong and Macau. She is actively involved in public art projects and over the years has won many awards issued from Hong Kong, China and the United States. Apart from the Hong Kong Museum of Art, Hong Kong Heritage Museum and Hong Kong Airport Authority, museums in Japan and China have also collected her artworks. In 2009 she became the first and only woman artist to be chosen in Sotheby’s inauguration of their Hong Kong Contemporary Art section. In the same year, another piece of her sculptures was auctioned in Singapore. As Man became more and more recognised, she focused on creating more art. She transposed her circular emblem onto 3-dimensional steel and brass pieces, asserting herself into the conventionally male-dominated discipline of sculpture. 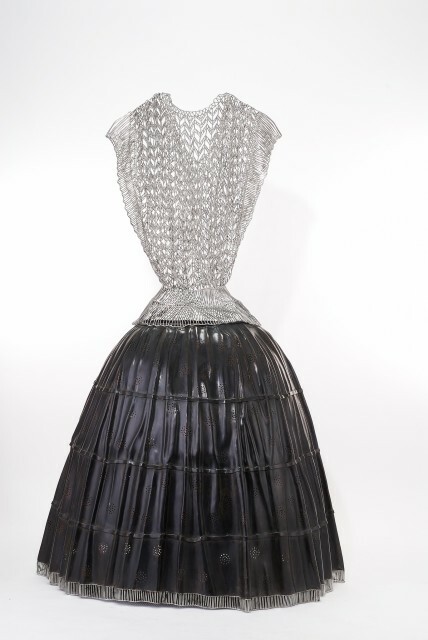 She also began to weave with metal threads, making metallic jackets, dresses, shoes and bags which are derived from her and her family’s own personal garments. Man exemplifies the interrelatedness of art and life. Her concepts, means of expression and formal choices are synthesised and developed to a high level of maturity. She succeeds in balancing the masculine and feminine, and harmonises oriental traditions and concepts with a medium and forms that are more closely affiliated with contemporary western art. Her work appeals to men and women from all over the world, thus demonstrating how high quality art can be a universal language that transcends gender and cultural differences.